Living Décor is a professional, specialist Plant Hire Service with our Head Office and Nursery based at sunny and frost free Katikati. We have over 400 m2 of glasshouses centrally located to serve our Hire plant clients in Hawkes Bay, Rotorua, Tauranga, Eastern Bay of Plenty, Taupo, Waikato, Auckland, Wellington and Christchurch. 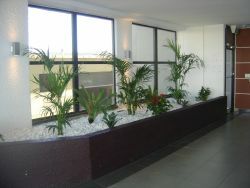 We have been supplying indoor plants for individuals and businesses since 1997. Our clients range from small businesses and homes, with one or two plants, to a one-site business, which has over five hundred of our plants. Alongside our Plant Hire business we also operate a very popular and successful Conference/Event and Wedding decoration service. Living Décor is owned and operated by Victoria and Gary Allwood, a husband and wife team. We are committed to providing a first class service to our clients. Alongside our fully trained, friendly plant Technicians, we ensure that your plants will always look their best following our regular plant and maintenance visit. Living Decor not only obtains top quality plants from New Zealand's top growers but we also both grow on and grow our own plants in our Nursery in Katikati. Katikati has long been known as the fruit bowl of New Zealand where produce of every description just flourishes. During World War 2 it was a government designated growing region responsible for supplying fruit and vegetables for the Armed forces. We too have chosen Katikati to grow our plants. The temperate climate, next to no frosts, and generous sunshine enables us to grow top quality plants without the need for any artificial heating at all. The results are plants of the highest quality that are extremely hardened and ready to cope with extreme office conditions. Any plants we choose in our plantscaping are of the highest quality, all ready to "provide the Wow! ".